Preheat the oven to 200°C/400°F/gas mark 6. 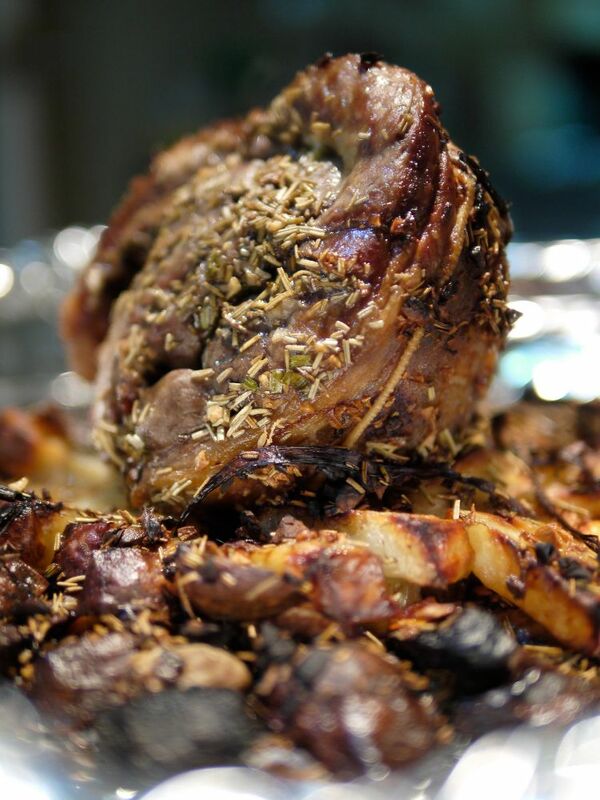 Rub the lamb with olive oil and season with crushed sea salt and freshly ground black pepper. Place the lamb in a heavy-based roasting tin with the shallots and roast for 30 minutes. Remove from the oven and drain off any fat. Add the rosemary sprigs and the garlic. Reduce the oven temperature to 130°C/275°F/gas mark 1. Return the lamb to the oven. Cover the tin tightly with foil and cook for 41/2 hours. Pour the red wine into a pan and bring to the boil over a medium heat. Remove the roasting tin from the oven and pour the red wine over the lamb. Return the lamb to the oven, covered, and cook for a further hour. Remove the lamb from the oven and carefully put the lamb, garlic and shallots in a warm serving dish. Be careful as the lamb should be just falling off the bone. Cover and set aside to rest. Place the roasting tin over a high flame and heat the wine juices. Skim off any fat and stir in the chopped rosemary season with crushed sea salt and freshly ground black pepper. Pour over the lamb and serve with creamed potato. For the creamed potato simply heat the cream and mix with the mashed potatoes, season and serve.